For those who have been looking for a wireless microphone system that's both reliable and super affordable, VocoPro is proud to introduce the VHF-3005. Superior sounding vocals, a clear signal and wireless freedom are what make the VHF-3005 an easy choice for singers and entertainers alike. This dual channel VHF wireless microphone system is the perfect solution for home karaoke, smaller gigs, public speaking and more. Both channels include individual volume controls for precise vocal balancing and individual 1/4" outputs for use with a receiver or mixer, allowing you pro-quality control over your vocal mix. The VHF-3005 is great for home entertainment, yet it has what it takes to withstand the challenges of public use. It is designed to better resist outside RF interference, so you can sing without any unwanted distractions. Set yourself free with a wireless system that's built to last and that will keep you sounding like great for years to come. 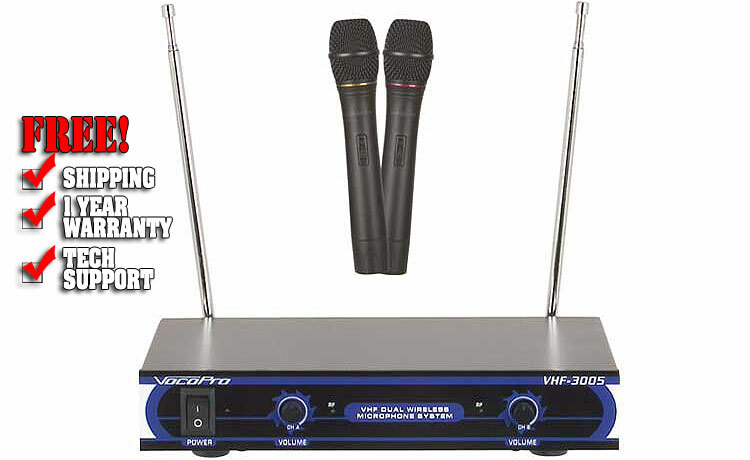 Head to your local VocoPro dealer and pickup a VHF-3005 today.